Why not plant some native fruits? Fruit trees and shrubs are a great way to expand your backyard food production beyond the vegetable garden. When I was growing up, we had a peach tree, a persimmon tree, blackberries, and wild plums to graze on, and my grandmother kept us supplied us with raspberries, Concord grapes, and apples. For a while, I lived on the West coast, where I had Meyer lemons, oranges, and apples in my yard. I’ll never forget the taste of the first glass of fresh-squeezed orange juice made from oranges picked that morning in my own back yard. Native North American fruits were often overlooked by European settlers. They gamely tried some of the new fruits that the native peoples introduced to them, but for the most part, they really missed the fruits that they were used to eating “back home.” So, they imported them. Apples, cherries, pears, oranges, lemons, limes….all were introduced to North America by settlers. It makes the phrase “American as apple pie” seem kind of funny in retrospect. The three main native fruit crops sold commercially are cranberries, American grapes, and blueberries. I wrote about cranberries, which include four species in the genus Vaccinium, here and here; the primary commercial cranberry is American cranberry, Vaccinium macrocarpon. In the same genus as cranberries, blueberries are cultivated and grown in the wild throughout the continent. The most common species are Northern highbush, V. corymbosum and lowbush, blueberry, V. angustifolium. The American grape, Vitis labrusca, is also called fox grape. Tmost well-known cultivar of the American grape is the Concord grape, Vitis x labrusca, which was developed by a grower in Concord, Mass. in 1849. 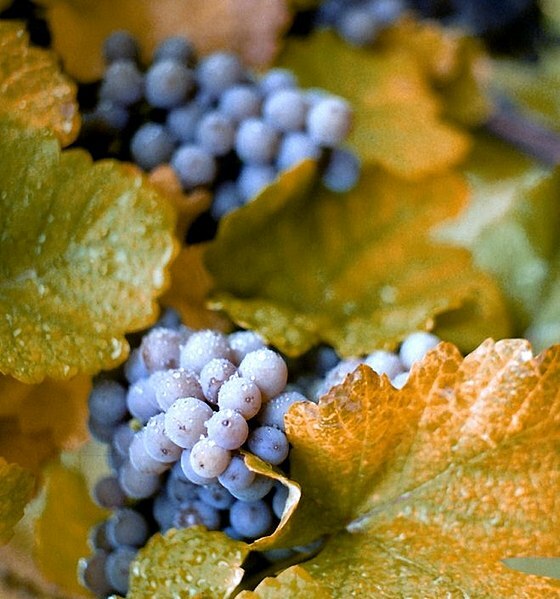 Other varieties of the American grape are the Catawba, Delaware, and Niagara grape. Lesser-known native fruits include the American Mayapple (Podophyllum peltatum), beach plum (Prunus maritima), and saw palmetto (Serenoa repens). And let’s not forget the scuppernong, a grape-on-steroids that is native to the Southeastern U.S.
Two that I find particularly interesting are the American persimmon, (Diospyros virginiana), the fruit of my childhood, and the pawpaw (Asimina triloba). The American persimmon isn’t as big as the Chinese persimmons that you sometimes see in supermarkets and I remember if you eat one before its time, it’s very sour. But a ripe American persimmon tastes heavenly, maybe like an apricot but sort of honey-ish and pumpkin-y. The fruit ripens in the fall, usually after all the leaves have fallen off. I remember that it was usually pretty messy underneath that tree. Doesn’t that sound fabulous!? I must taste this fruit. 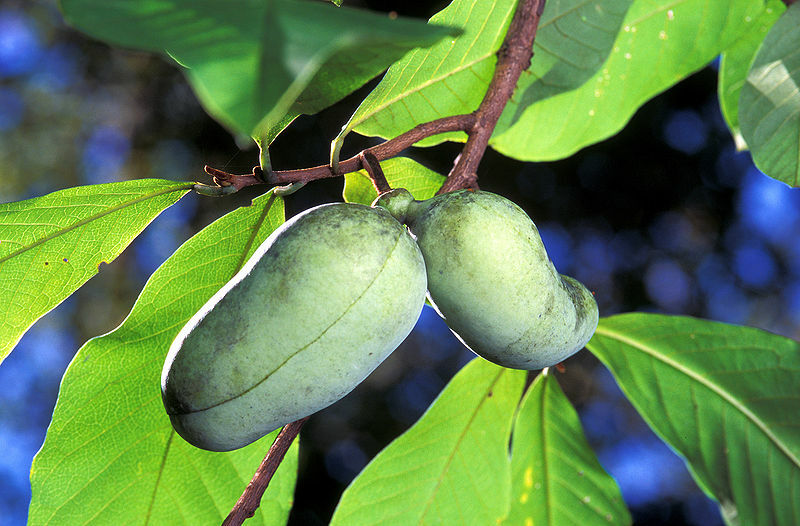 Pawpaws look like a tropical fruit–the fruits look like mangoes and grow in clusters like bananas. But since they’re native to Eastern North America, they grow in temperate zones. They’re found naturally south of New England to north of Florida and west to Nebraska. Supposedly they can be grown in cold zones such as New England, though they are reputed to be hard to establish. Pictured above, from top to bottom, are Concord grapes (courtesy of Wikipedia), scuppernong (courtesy of the State Library of North Carolina), American persimmon (courtesy of Cornell University) and pawpaw (courtesy of Wikipedia). I’d love to try a pawpaw too. I agree, sounds like a fabulous blend of flavors. I’ve never had a persimmon either, what are those like or similar to? I do remember picking fresh oranges and lemons in CA though, while visiting, such a treat to have these citrus fruits fresh from the tree. Here in BC, probably the most popular tree fruit is different varieties of apples, basic but delicious too. A very interesting article. Bedfordshire Giants are our favourite native blackberry! The racoons almost always find ripe persimmons during the night after I have decided to wait just one day longer for the ripening. Hi G., I couldn’t agree with you more about apples, even though they’re not natives here they still make the best pie! Top Veg, blackberry jam is one of my favorite things in the world. I don’t know if I’ve ever had a Bedfordshire Giant though I like the sound of it. I like the name, Paw Paw … I’ve always wondered what the fruit tasted like. Growing up with Persimmons must have been wonderful. There was a paw paw tree at my college in Pennsylvania — they are super good! And they grow in shade too, apparently. They really are like custard. I want to find out if they will grow in Northern California. PS Off topic C, but we’d (Joe and I) would love to see a new post re: companion planting. With gardening season just around the corner, it would be interesting to see what goes with what LOL 😉 in the garden patch. All I know about so far is that tomatoes and basil work out well, planted good side by side (or so a plant expert told me, when I was interviewing him, years ago). How can you tell I am a real novice when it comes to gardening LOL??? Doesn’t mean that I don’t appreciate and enjoy reading about all that it entails though, I really like stopping by! Hi Kate, of course as a kid you never appreciate what you have, especially “some old fruit tree.” (at least I didn’t.) I’d love to have that back yard now. Hi Sara, glad to meet someone who actually tasted a pawpaw, hope I get to have one sometime. Wonder why they don’t turn up in supermarkets, must be really difficult to get them to market. Thanks Caroline, looking forward to the companion planting post too. So – what is the yellowish (single) fruit in the third image? It looks like something I saw recently in Virginia (although what I saw in Virginia was shriveled and more dried on the branch – is it the American Mayapple maybe? I’m trying to keep citrus in the ground now (in coastal South Carolina) – and so far, so good – the mandarin satsumas are doing well, although the Meyer’s Lemon’s are struggling a bit (even with some protection). I’m eyeing something that a SC citrus grower calls a ‘Ten Degree Tangerine’ – that sounds just perfect for my coastal garden. And of course there are blueberries. They love my sandy, sunny garden. Thanks for stopping by my site, and the whole Blotanical thing (which I am somewhat new at). I’ve been a bit busy and pre-occupied, but it is fun seeing new sites such as yours. Hi Pam, I really enjoyed your blog. I’m originally from NC so seeing your lush vegetation pics made me a bit homesick & jealous. You’re lucky you have lemons! The third pic is the persimmon. Thanks for stopping by. Great idea! I’m hoping to get some raspberries and blackberries going this year. I’m interested in grapes too, and after this post, paw paws. I loved your post! I’d love to try planting a persimmon. As for paw paws, I have a tiny young one in a pot that will go to its new home in the yard this spring. Thanks for your wonderful post. Pawpaws do sound great; my Dad said there used to be wild trees in SE Oklahoma where we grew up, but in reading about them I found that the flowers smell bad and that might be why we don’t see these drought tolerant, big native fruit trees in more yards. I’m looking for thorny, upright blackberries with the old fashioned flavor vs sweet ratio, to make a hedge around the yard — anyone have a favorite they can recommend for NE Oklahoma? I live in Richmond, Virginia, and in some of the local parks along the James River, paw-paw trees grow naturally and abundantly. My wife and I were walking a heavily wooded trail along the river this past fall, and there would be a cluster of paw-paw trees about every 20 feet. The fruit was fully ripe. I had never heard of paw-paws either, but we ran into a local long-time resident of the area in the park and had to ask him what that amazingly terrific aroma was. No lie, he just so happened to be cutting a paw-paw fruit open with his handy pocket knife. He said it is the best fruit you could ever eat, but he also said they have absolutely no shelf life (which is why he was eating them there at the park!). I am really into growing native plants, so naturally I asked him how easy it would be to grow a paw-paw tree or two. He said his friend attempted to do so a few years ago to no avail because these are “river trees.” You literally have to be in a river or stream bed for these things to grow successfully. They need constant moisture I guess, without the super intense tropical heat. They are also undergrowth trees, growing well only when taller trees provide thick shade. Which makes them a unique, almost tropical plant native only to temperate zones. I too will try a paw-paw around next fall when the fruit is ripe! I live in Locust Grove VA and we came across a bunch of PawPaw trees this morning, along the Rapidan river (there is a common theme here) so now we know what they are. My Friends dogs had a feild day eatting them. I picked on up and smelled it and it smelled wonderful! My dogs weren’t too interested. After looking them up I remember my ex-husband talking about pawpaw’s he would eat as a kid and would eat so many he would get sick (apparently very rich). So my friends dogs are a bit sick today. oops. I will have to try one tomorrow! I have been looking for information on the types of trees associated with Paw Paws. I have a little woodland with Red Oaks, Amelanchiers and a Persimmon. Those of you who live where Paw Paws are native, can you help me out? I live in northern California, and would like to replicate, as much as possible, their native environment and plant companions. Thanks! The reason that pawpaws are not more popular is because they are so perishable that they don’t hold up well in commercial production and transport. Very short shelf life and they bruise easily. I live outside Richmond and can second what Jay says. They grow like weeds around here. I’ve watch the numbers double each year in the wooded acreage behind my house – which happens to be full of tall shady oaks and up the hill from the James River. They seem to thrive in shade and moisture. Their flavor and texture reminds me a lot of mangos. They’ll be ripe in late August, early September, I believe. You can find Paw Paw all along the Potomac river in Northern Virginia. I agree with Jillian, they sprout up in clusters. I wouldn’t call it the best fruit I ever ate though… I eat lots of things found in the wild.